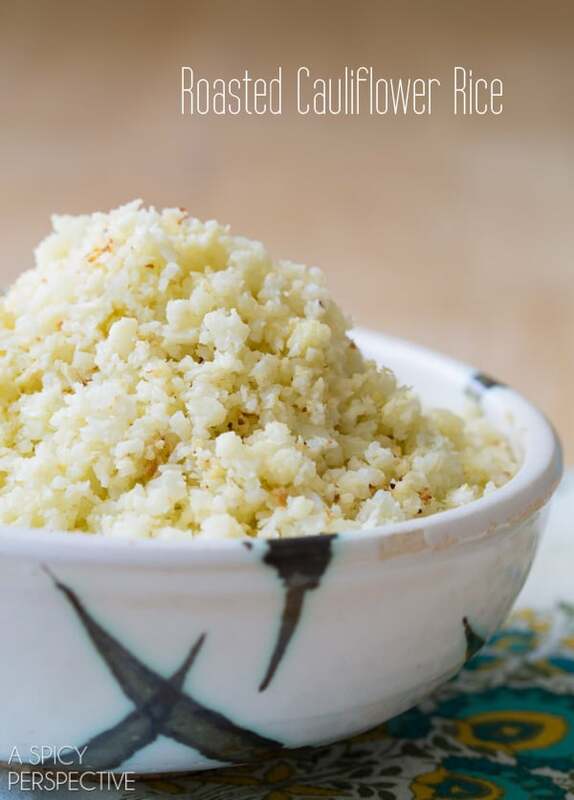 Easy roasted cauliflower rice to serve with your main course of choice. This “rice” is a wonderfully healthy rice substitute for those on a grain free diet. Plus it just tastes good! So… as you can see by the name, this cauliflower rice isn’t really rice at all. 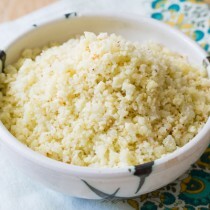 However, if you are on a strict #paleo or #grainfree diet, cauliflower rice is a life saver. Even if you’re not, it’s a fabulous low-carb side dish that everyone in my family loves. I simply grind cauliflower in the food processor until it reaches the size of rice, then I toss it with olive oil and roast it. Heck, it looks, feels, and even kind of tastes like rice. Who knew?! The first few times I served this to my family, the kids were halfway through dinner before they realized it wasn’t real rice. 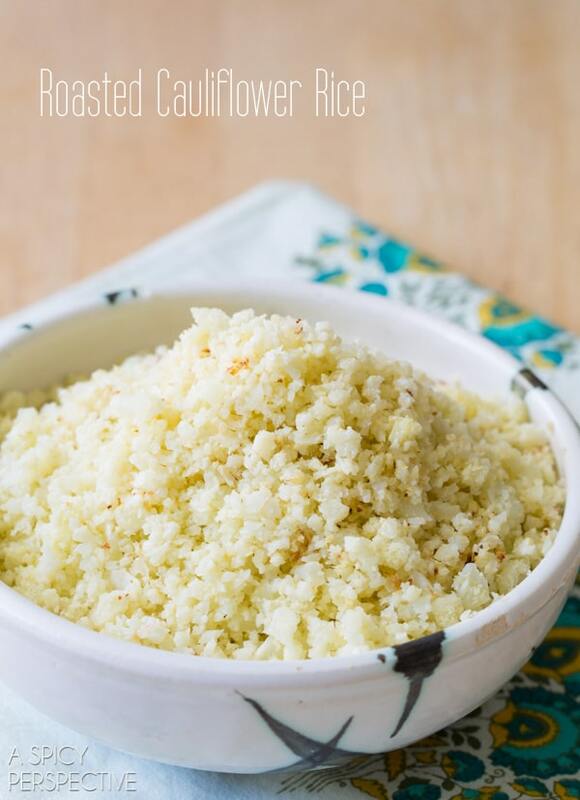 So if you’re looking to lighten up your diet, or are just curious, give cauliflower rice a try. 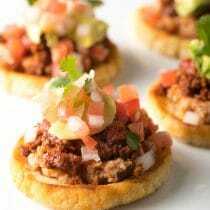 You can serve it with any of these dishes for a fantastic low carb meal! Preheat the oven to 450 degrees F. Cut the cauliflower in half and remove the core and leaves. Roughly chop the cauliflower and place in the food processor. Pulse until the cauliflower is small and fine like rice. 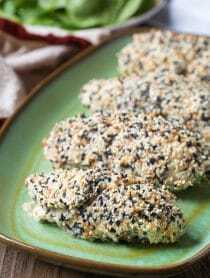 Dump the cauliflower rice out onto a large rimmed baking sheet (If your baking sheet is average sized or small, use two.) Drizzle the olive oil over the top. 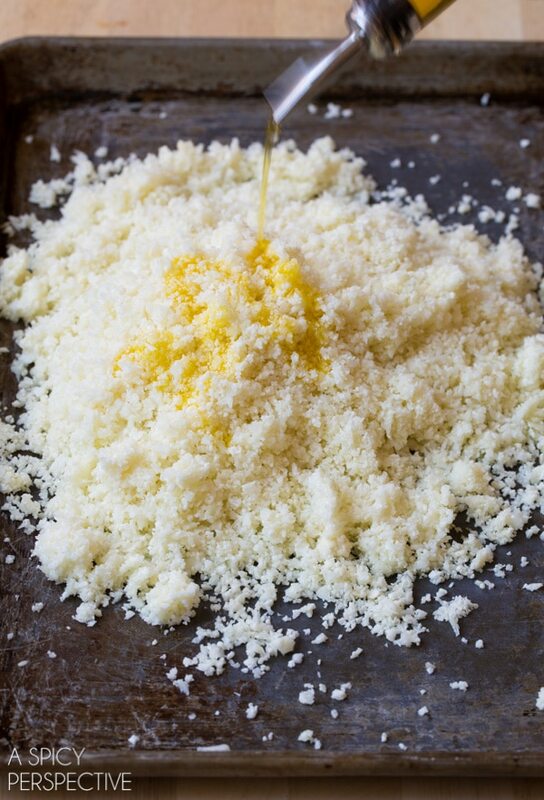 Then mix with your hands and spread the cauliflower rice out into a thin layer. Sprinkle with salt. Roast in the oven for 5 minutes. Then stir and smooth out again. Roast, another 5 minutes. Serve warm. NOTES: Sometimes I like to add a little curry, cumin, or chile powder to the cauliflower rice, depending on what I’m serving it with. Finally getting around to trying this. Awesome – added it to a veggie burrito with some cumin and chili powder, very tasty. I’ve really been wanting to try this! It looks so good! I simply put cauliflower raw in foodprocesser till rice like. Then I saute an onion with some butter and garlic and add cauliflower. Put the lid on and let it cook for about 5minutes. Really nice! 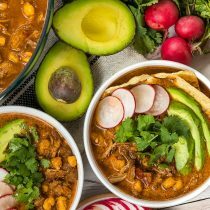 Definitely want to try this recipe! My kids love roasted cauliflower so I can’t wait to try this “rice” version! I love cauliflower “mashed potatoes” so I’m anxious to give this a try! 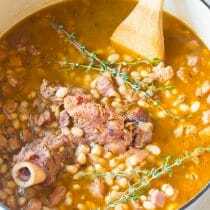 Yours and my friend Adriana told me about you.I love your website and Adriana loves your food.Can’t wait to try your recipes..
Love how this can be an extremely quick way in getting dinner on the table, yet the flavour doesn’t give anything away! Thanks for sharing Sommer! I have a question though: does the cauliflower have to be very fresh? I do hope this can be a smart, yummy way to use up cauliflower that might be on its way out soon. Ooooh what a great twist on rice! Love it! I just hopped on the cauliflower rice train, and love it, but roasting the cauliflower?! AMAZING idea!! 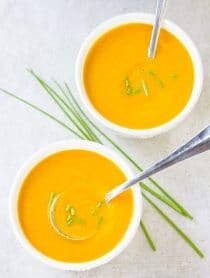 Great alternative to rice! I really need to try this! I need to make this! It looks so light and fluffy! I love cauliflower rice, it’s so versatile! I love making cauli rice in the microwave but have never roasted…looks delicious! Sounds like a great way to decrease amount of water in the final “rice”. Thank you so much Sommer! How long can I keep it in the fridge? Looks DELISH!! 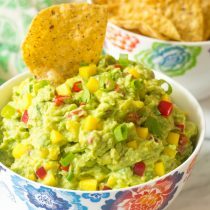 I’d love to try this, we have been going more grain free around here! 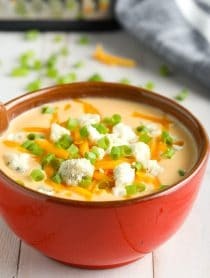 So delicious, one of my very favorite ways to enjoy cauliflower! We have been on a cauliflower kick lately! Love cauli rice and even make a pizza crust out of it! This is seriously so cool and an awesome alternative to rice!! This looks like the perfect healthy side dish! I am so into this. I have really, really been wanting to try it, and now you have sold me! I love cauliflower rice, too. So easy, just a little time consuming. We make a stir fry with it. YUM! Thanks for sharing! I sooooooo need to try this! And definitely could use a big bowl after our weekend in Miami! So easy!!! I’m going to have to try this soon! Love cauliflower rice! Great side for any meal! Good reason to break out the food processor! I’m just waiting for cauliflower prices to drop. They are outrageous right now. Wish I had a food processor…this looks great! I’ve been wanting to try this forever!! My sister talks about how good it is. This just pushed me over, going to try this week :) Mmmm!! I love making cauliflower rice, but I never cook it first. Love this idea for a lite summer side! So, after Miami, I NEED this healthy little cauli rice in my life. 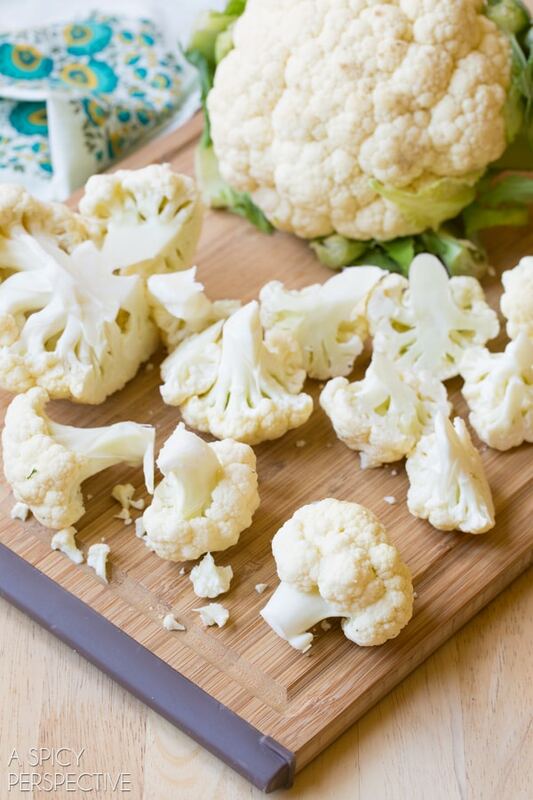 I love cauli rice, but I have never roasted the cauli beforehand….YUM! Pinned :) So great to meet you!